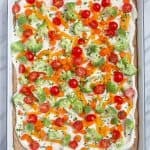 The best part about making these Cold Veggie Pizza Appetizers for your game day party? You can prepare all the components ahead of time and assemble them right before kick-off! To make the crust, mix the water and sugar in a small bowl and stir until the sugar dissolves. Sprinkle the yeast on top. Set aside until the yeast becomes foamy. Meanwhile, add the whole wheat flour, all-purpose flour, salt, and baking powder to a food processor and pulse briefly to combine. Add the butter and pulse several times until the butter is in very small pieces and the mixture resembles coarse sand. Add the Greek yogurt and the foamed yeast mixture and pulse a few times. Dump the dough into a large bowl and knead with your hands until it comes together into a ball. Cover the bowl with a kitchen towel and let the dough rise in a warm place for 45 minutes (the dough may not increase much in size). Preheat the oven to 375°F and grease a large baking sheet with olive oil. Place the dough in the pan and pat it out into an even layer that reaches the edges of the pan. Bake for about 15 minutes, or until the crust is golden brown around the edges and the middle springs back when you press on it. Let the crust cool completely before adding the sauce and toppings. To make the sauce, mix the cream cheese, Greek yogurt, ranch dressing, lemon juice, dill, salt, pepper, and garlic in a large bowl until smooth. Spread the sauce evenly across the cooled pizza crust. Sprinkle the chopped vegetables and chives on top of the pizza. Cut into squares and serve cold or at room temperature. Make this pizza your own by using your favorite veggies or whatever is in season near you. The pizza dough can be baked up to two days in advance and stored covered on the counter. The sauce can be mixed up to two days in advance and stored covered in the refrigerator. If you chop your vegetables in advance, too, you’ll only need to spend about five minutes putting this together the day you’re serving it.